Helijet International Inc. disrupted the aviation world on November 27, 1986, when it launched Canada’s first scheduled helicopter service between Vancouver and Victoria. It was one of the planet’s first pure plays in an air-taxi sector now dubbed as Urban Air Mobility, with the pending arrival of hybrid-electric or all-electric vertical landing and take-off vehicles (VTOL). One of Helijet’s founders, current president and CEO Danny Sitnam, recalls speaking with his partners around 1985 because he felt helicopter technology seemed ready to begin scheduled air-taxi services, with the ability to fly at night and, arguably, handle more inclement weather than a VFR seaplane service. Car-carrying ferries were still slow between the Lower Mainland of Greater Vancouver and Victoria on Vancouver Island, even as commerce between the two areas grew, driven in large part by the island holding the provincial legislature. 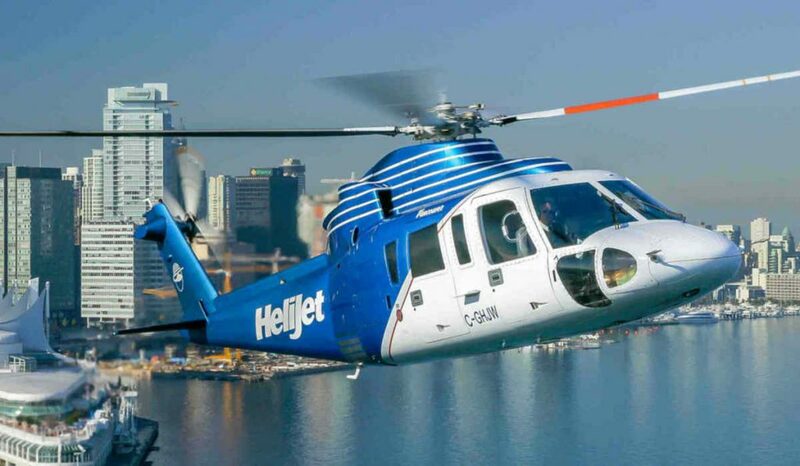 From its beginnings, with a leased Bell 412 helicopter, making the 32-minute flight from Lower Mainland to Vancouver Island about eight times a day, Helijet today is regarded as the world’s largest scheduled helicopter airline having carried more than 2.5 million passengers. The publicly traded company now holds operations in Richmond, Vancouver, Victoria, Nanaimo, Prince Rupert and Haida Gwaii, in addition to its Pacific Heliport Services subsidiary, which is Canada’s largest operator of publicly and privately designated heliports. Emphasizing these are just a few of the things that need to happen from an operator’s perspective, Sitnam first points to the need for access to “patient capital.” He also stresses employees need to be assured that the vision of an eVTOL service is clear; and that systems manufacturers must wring-out every risk in their programs and products during these early days of development, which he also ties to developing the highest levels of service and safety standards. “If a company like Helijet is to provide VTOL service to its customers, heliports – vertiports – must be designed with ease of access,” says Sitnam. He then describes the footprint of Pacific Heliport Services, which manages and operates three large, certified waterfront heliports, including a unique floating helipad on Vancouver’s waterfront that can house up to five helicopters in addition to offering fuel services. Sitnam explains any eVTOL-driven heliports (or vertiports as the Urban Air Mobility crowd prefers) must be in “non-exclusive proximity” to business centres and residential communities. “Each carrier like ourselves must work with city [planners] and communities to gain the understanding, trust and respect needed for new eVTOL landing sites, so they can be designed to stick around for the long haul like airports,” says Sitnam, noting that non-travellers living underneath all of the proposed air-taxi traffic must also be satisfied. Sitnam then begins to describe Helijet’s current perspective of eVTOL potential, reiterating the existing services provided by Helijet. The company, which holds licenses to operate cross border, is also currently looking at introducing a nonstop service between Vancouver and Seattle. “Today, for us, it is difficult if not impossible to fly the last few miles to our traveller’s most-important destination, which is their home or the suburbia office – and that is the challenge,” he says. Customers have spoken with Sitnam directly about the difficulty in travelling to and from existing heliports, often located in large downtown areas or at airports. “We have this [potential] vision at Helijet: Deplane helicopter, transfer onto an eVTOL, and get into your suburbia areas in very real, effortless time. Sitnam estimates Helijet is already saving, for example, four hours of travel time between Victoria and Vancouver for most travellers. The ability to cut out another hour and a half as it relates to heliport travel would present a powerful incentive for customers. Helijet is a highly community-minded company, supporting a range of not-for-profit initiatives like Power To Be, which helps people living with a barrier or disability access nature; hospital programs in both Vancouver Island and the Lower Mainland; and the Pacific Salmon Foundation, among others. It comes as no surprise when Sitnam also begins to discuss the possibilities for eVTOL programs to have an impact well beyond the congestion of urban and suburban centres.